Editor’s note: This story originally ran in April of 2018, but is being reposted now in honor of Martin Luther King Jr. Day. 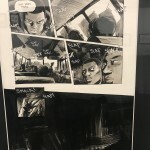 For those interested in reading comics about The Civil Rights Movement, check out CBLDF’s Using Graphic Novels in Education for some great suggestions. 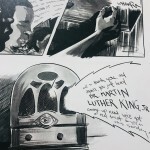 In April of 2018, artist and comics journalist James Romberger solved a mystery that had been bothering comics lovers and comics historians for some time, who drew Martin Luther King and The Montgomery Story, a civil-rights comic credited for inspiring Congressman John Lewis and countless others into activism. Romberger discovered Sy Barry was the identity of the artist behind the civil rights comic that not only changed the medium, but the history of the United States. 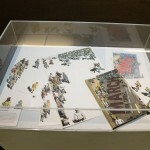 The book’s wide distribution through churches and schools created a means to disseminate information on non-violent resistance, a tactic which helped bring about victories in The Civil Rights Movement. 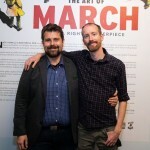 The comic inspired Congressman John Lewis who, with his collaborators Nate Powell and Andrew Aydin, created The MARCH trilogy, an award-winning memoir of activism and change. 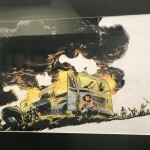 But until Big Apple Con in New York City last year, the iconic artist of the work remained a mystery. Actually, until 2012, most things about the groundbreaking comic were still mostly unknown. In an interview from 2015, Aydin talks about the process of uncovering information for his graduate thesis at Georgetown University. There wasn’t a lot to go on or too many people interested in Martin Luther King and The Montgomery Story at the time, so I had to take more of a gumshoe approach to research. 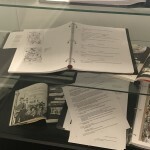 I reached out to the few people who had written about the comic before and asked them a lot of questions until I was able to get a look at some of the original letters between [writers] Alfred Hassler, Benton Resnik, and others. That got me talking to Jim Lawson and other people associated with the Fellowship of Reconciliation, past and present. Along the way, Professor Sylvia Rhor was incredibly helpful. All the while, Eddie Campbell was giving me feedback from a comics history perspective about what I was piecing together and how it all fit. For those interested in reading a version of Aydin’s thesis edited for publication, check it out here. It was published in 2013 by Creative Loafing as their feature article in the “Future of Nonviolence” Issue, guest edited by Congressman John Lewis, himself. 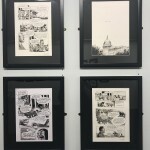 Cartoonist Eddie Campbell believed that either legendary golden age artist Sy Barry or his late younger cartoonist brother Dan Barry had been involved. Aydin tells me that he and Campbell worked with comics scholar Jim Vadeboncoeur, Jr. and the Digital Comics Museum to confirm this, but their attempts to contact Barry were unsuccessful. When I told Sy Barry of the long search for his identity that had been undertaken by Aydin and others and the importance accorded the comic by Congressman Lewis, Barry told me that he has very great respect for Representative Lewis and considers him to be the most worthy member of the legislature. Check out the full story along with a breakdown of Big Apple Con here. 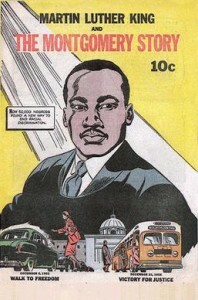 If you’d like to read Martin Luther King and The Montgomery Story, it is available through comiXology for just $1.99. 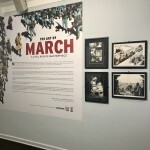 At the same time as Big Apple was going on in 2018, Society of Illustrators was exhibiting MARCH: A Civil Rights Masterpiece, which was a visual walk through Congressman John Lewis’ award-winning graphic memoir. 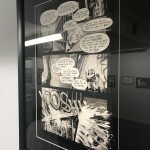 Co-curated by CBLDF Executive Director Charles Brownstein and Kitchen Sink Press’ John Lind, the show focused on the breathtaking art of Nate Powell, in tandem with original essays by Jonathon Grayson and artifacts from the trilogy’s creation. 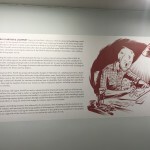 Check out some of the highlights below or listen to co-curator Charles Brownstein and artist Nate Powell talk about the exhibit in their own words. Andrew Aydin and Congressman John Lewis are currently putting the finishing touches on the newest installment of Lewis’ memoir – RUN – taking place after The MARCH Trilogy and chronicling the Congressman’s political start, due out in June 2019. If you haven’t read The March Trilogy or haven’t reread it in a while, pick up a copy of Book One or the entire trilogy in a lovely slipcase edition hand-signed by artist Nate Powell and co-writer Andrew Aydin, and support CBLDF in the fight for free expression.